When people are interested in getting Braces or Invisalign, they often have multiple questions to ask their Orthodontist. While asking questions is great, Orthodontists often get asked the same common questions. We are here to tell you about the 7 common myths about orthodontic treatments. Patient with clear braces treatment, looking at camera. 1. Can Anyone Provide Braces And Aligners, Not Just An Orthodontist? Most AAO Orthodontists offer free consultations and flexible payment plans. Most offices are willing to work with their patients to help them achieve the beautiful smile they desire. AAO Orthodontists carefully customize their patients’ treatment plans, and the fees will depend on the complexity of specific cases. that your treatment stays on course. only take a few months, to more complex treatments that can take much longer. getting your treatment done in a safe, timely manner. At our Orthodontist office, you will find that we offer four different types of braces for everyone’s individual needs. These four options include: Invisalign, ceramic braces, regular braces, and six in 6. Invisalign are seen as the clear alternative to braces, which we see a lot of adults getting. Ceramic braces are translucent and also very popular with our adult patients. Our regular braces are our most common type of braces made out of stainless steel. And lastly, we offer six in 6. Six in 6 are our clear braces that gently straighten and align teeth in an average time of just six months. This is very much false. 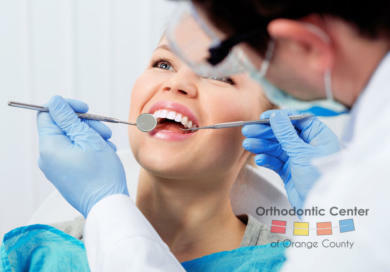 We at the Orthodontic Center of OC have a ton of adult patients. While it is more common to have younger patients, we love helping our adult patients achieve the smile that they have always desired. Whether our patient is young or old, anyone can benefit from an Orthodontic treatment! Invisalign vs. Braces: Which Best Suits your Dental Needs? Contact us to set up your complimentary consultation. 2019 © Orthodontic Center of Orange County. All Rights Reserved.